“Are you an a#$hole?” That was the question two different potential clients recently asked of me, a divorce attorney on the outskirts of Seattle, where acceptance, calm, and coffee usually rule the day. The gist of the question was nonetheless a common one: Are you aggressive, bulldoggish? I understand why potential clients ask that question. No other litigation is as personal as a divorce (read, ‘dissolution’ in Washington). While other types of litigation, such as a breach of contract matter, may evoke anger in one or both litigants because one party feels betrayed by the other, no legal matter can cut to the core as does a dissolution proceeding. Similarly, in my opinion, no other litigation has as much at stake as a dissolution, especially when child custody is involved. A client does not have to explain to me why s/he wants to fight in a family law case. I understand. But, is “are you an a#$hole” the right question to ask? In a sense, it is. You want a tough attorney who will fight for you. And, in your mind, you definitely want a fight. You may be angry and you want someone who will “punish” your spouse. Or, because of what is at stake, you don’t want to take a risk on someone “weak” representing you. You have one chance and you do not want to waste it on anyone other than the heavyweight champion. Those feelings are all normal, but do not represent everything that a client seeking to hire an attorney for a family law matter should consider. More significantly, the most aggressive attorneys are not always the champions. In fact, hyper-aggressive attorneys usually lose in court. This information is hard for some people to believe. But, it makes sense when you look closely at what attorneys do at hearings and trial. A family law attorney stands in front of a commissioner or judge and serves as the client’s mouthpiece. At some point during the proceedings, probably multiple points during the proceedings, your attorney will be asking the commissioner for something for you. You have to consider whether an impartial individual would want to give it to you. 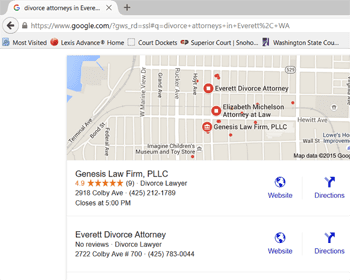 The legal community in Washington is small compared to other places and the commissioners and judges usually have familiarity with the attorneys who appear before them. If the commissioner or judge does not trust your attorney, s/he will, by extension, not trust you. Commissioners and judges are, after all, human, too. It is often said that attorneys do not win cases; instead, it is facts that win cases. However, your attorney, the individual who is associated with you in court, can cause the commissioner or judge to NOT give you what you want. For that reason, when seeking to hire an attorney for a family law matter, you should delve deeper than that superficial question. There are times when your attorney absolutely should not be an “a#$hole”. The best attorneys work hard, engender trust, and engage with the decision-maker rather than fighting with him/her. When searching for a lawyer, look at his/her credentials (which are often an indication of intelligence and work ethic) and the firm’s reviews (which, hopefully, reflect past results). Beyond that, the main focus should be whether the potential lawyer can connect with you. Obviously, you are not searching for a new best friend. But, you want to determine whether s/he is listening to you, will give you and your case the personal attention you deserve, and can connect with you and a decision-maker. While you want to hire an attorney who is businesslike, you do not want an attorney who is too jaded from having represented dozens of clients in family law proceedings and who is not interested in listening to you or who sees your case the same as every other case. If your attorney is not interested in listening to you and/or trying to understand why you are saying what you are, you may think that you did hire an “a#$hole” and not be pleased with your choice because that “a#$hole” in court is really just an “a#$hole” all of the time, including when you do not want him/her to be one. You can tell a lot about your prospective attorney while speaking on the telephone with him/her and during your initial consultation with him/her. Sure, the attorney with whom you are talking or meeting can “fake” it for 30 or 60 minutes and present an image different from what s/he really is because s/he wants your business. However, if you listen to the attorney and observe him or her during your meeting, you can pick up cues that will help you decide whether the attorney is the right attorney for you. More likely than not, if you conclude during your meeting that the attorneys is an “a#$hole”, you will not want him or her to represent you.